Saudi Arabia's Crown Prince Mohammed bin Salman (left) shakes hands with Egypt's President Abdel Fattah al-Sisi. (by Agence France-Presse [AFP], March 5) RIYADH – Saudi Arabia and Egypt have set up a US$10 billion joint fund to develop a mega city, a Saudi government source said Monday (March 5), as Crown Prince Mohammed bin Salman visits Cairo. The deal is aimed at developing the Egyptian side of NEOM, the futuristic project bordering Saudi Arabia and Jordan which was unveiled by Prince Mohammed last October as part of plans to diversify the kingdom’s oil-dependent economy. “Saudi Arabia signed (an) investment agreement with Egypt to develop Egyptian lands in the south of Sinai to be part of the NEOM Project,” the government source told AFP. Prince Mohammed’s visit to Cairo is the first leg of his maiden foreign tour as heir to the Saudi throne. 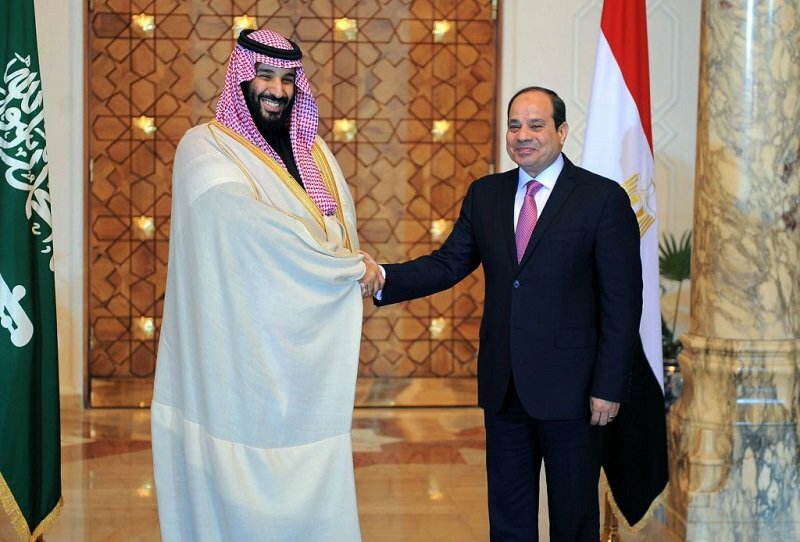 [Egypt and Saudi Arabia have strengthened ties since al Sisi took power in 2013 after ousting the Muslim Brotherhood, which both countries have banned and designated as a terrorist organization.]. The NEOM deal underscores growing strategic ties between the Arab world’s richest and the most populous states – Saudi Arabia and Egypt – who are both opposed to Iran’s influence in the region. Egypt is nominally part of a Saudi-led military coalition which intervened in Yemen in March 2015 to fight Iran-backed Houthi rebels. The two allies are also part of a bloc of nations that has boycotted Qatar since June over alleged ties to Islamic extremists and Iran. Prince Mohammed’s visit comes ahead of Egypt’s presidential polls, scheduled for late March, with incumbent Abdel Fattah al-Sisi expected to win a second four-year term. The powerful crown prince is expected in Britain on Wednesday for talks with Prime Minister Theresa May and in the United States [Riyadh’s closest Western ally] from March 19 to 22. He is also expected to visit France in the coming weeks. The $500-billion NEOM, meaning “new future” in a combination of English and Arabic abbreviations, is planned to be a biotech and digital hub spread over 26,500 square km [almost 16,500 sq miles] in an area facing Jordan and Egypt. 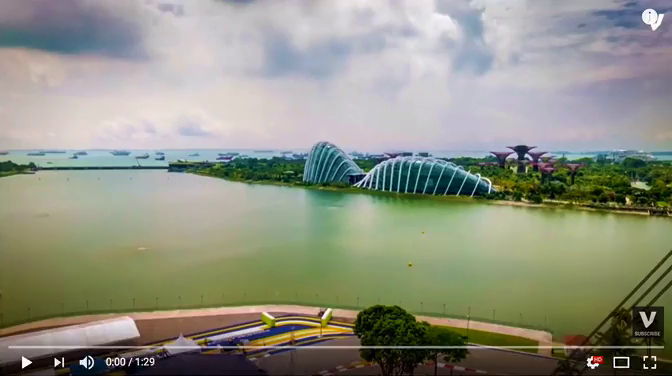 b) What is the purpose for Prince Salman’s NEOM? c) What is the significance of the deal between Saudi Arabia and Egypt? d) Saudi Arabia’s new city of the future NEOM will supposedly allow women to have equal rights. Describe the hypocrisy here. 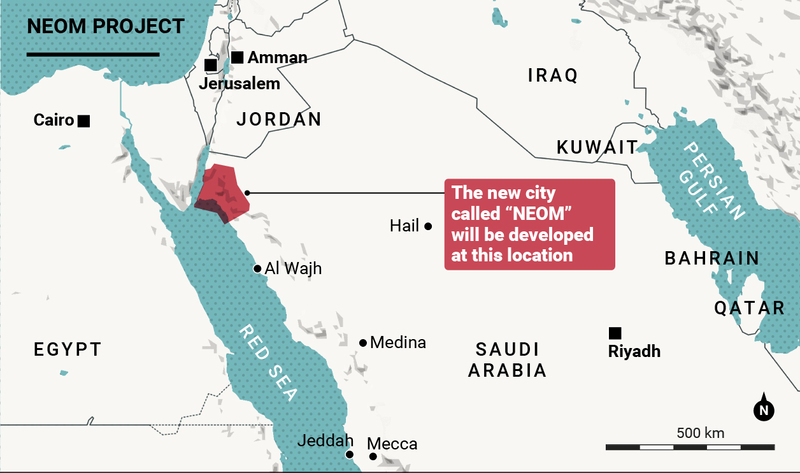 Neom is a planned 10,230-square-mile (26,500 sq km) transnational city and economic zone to be constructed in Tabuk, Saudi Arabia close to the border region of Saudi Arabia, Jordan, and Egypt (via a proposed bridge across the Gulf of Aqaba). 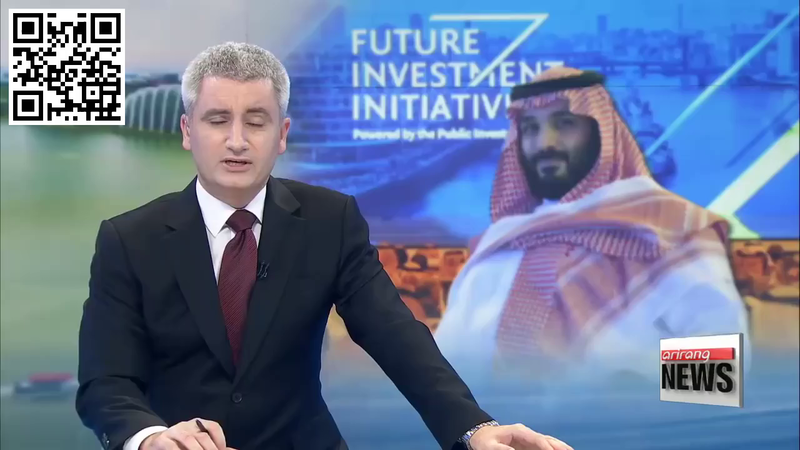 The city was announced by Saudi Crown Prince Mohammad bin Salman at the Future Investment Initiative conference in Riyadh, Saudi Arabia on October 24, 2017. It will operate independently from the “existing governmental framework” with its own tax and labor laws and an autonomous judicial system. The German Klaus Kleinfeld, former chairman and CEO of Alcoa Inc., and former president and CEO of Siemens AG, will direct the development of the city. Plans call for robots to perform functions such as security, logistics, home delivery, and caregiving and for the city to be powered solely with wind and solar power. Because the city will be designed and constructed from scratch, other innovations in infrastructure and mobility have been suggested. Planning and construction will be initiated with $500 billion from the Public Investment Fund of Saudi Arabia and international investors.